Novak Djokovic may occasionally get tired and need some R&R after a long match or tournament. But professional tennis’ No 1 joker doesn’t ever let the chance for a laugh slip by. So Friday morning, which found the current world No 1 at the Burj Al Arab’s sea turtle rehabilitation centre, tasked with naming one of the animals having treatment, provided the perfect opportunity. “I name him Leonardo,” said the Serbian player, who didn’t immediately explain his choice of name. Is he an art lover? Or is it because he speaks Italian fluently (he spent much of the shoot gabbing in Italian with his agent, an Italian)? Nope. It’s because he loves the Teenage Mutant Ninja Turtles, of course. 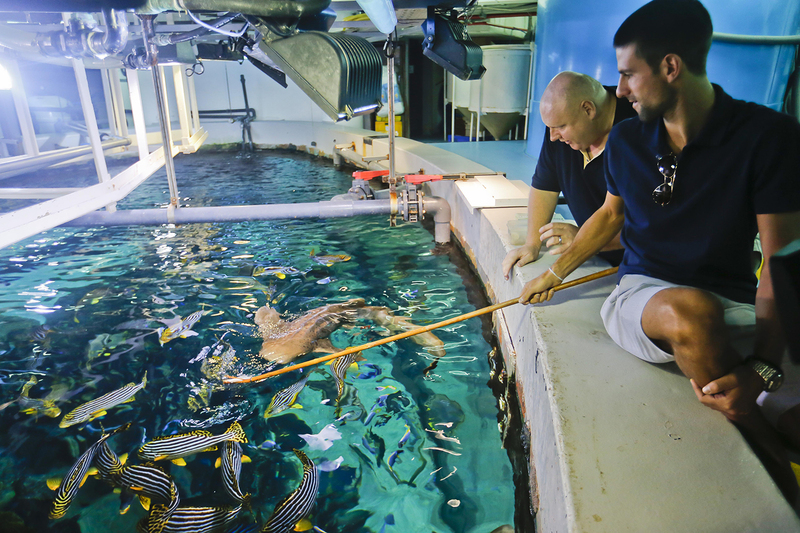 Djokovic — who last year recreated the famous tennis match on the hotel’s helipad with this year’s defending champion Roger Federer — then explored the aquarium’s “rehab” centre for sea turtles. One tank held two juvenile hawksbill turtles, some of the injured or sick turtles that are handed into the unique centre by members of the public. Baverstock was keen to stress the centre is intended to help turtles get sea-ready after injuries sustained by coming into contact with boats, debris or falling sick, as well as educating members of the public. “The turtles are never put on display,” he said. The 10-month-old hawksbills will stay around four-six months, and once feeling better, are moved to an outdoor pool at the Mina A Salam hotel next door, where they have plenty of room to swim and forage, and members of the public can watch and learn about the programme, which has been run in coordination with the Dubai Falcon Hospital and the Wildlife Protection Office since 2004. 30 turtles are currently in rehab, and will be released once sea temperatures are higher, around May. 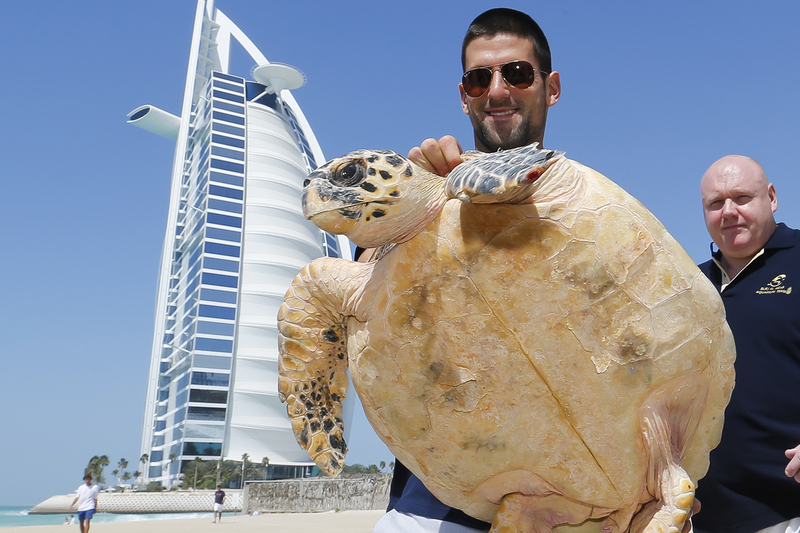 Djokovic’s turtle, Leonardo, was making the move from the indoor centre to the public pool that morning, and like the Burj Al Arab’s human residents, got a treat from a cool damp towel as he headed to the beach. Then it was the player’s turn to practise picking him in preparation for the pool drop off. Making it look easy, Baverstock grasped the shell at head and tail and lifted Leonardo gently. 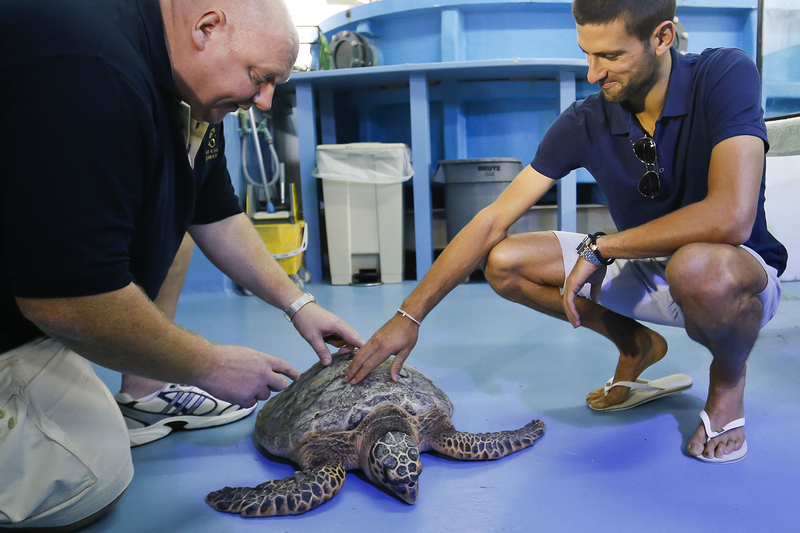 Djokovic was in for a surprise on his turn, letting out a howl once he’d put the turtle down. “How much does he weigh?” Turns out 20-year-old Leonardo is a hefty 30kg. Let no-one say Djokovic isn’t game for anything. Offered the chance to stand at the side of the pool and lower the turtle in, or get in the water and take his new friend to his new home personally, the Serbian held up a bag. “I brought my bathing suit. I’m going in.” The self-confessed animal lover — he had cats and dogs growing up -— hung out in the pool, to the delight of the smaller turtles, who zoomed around him, and the lucky Friday brunchers who spotted the player. Turtles: What you can do? – Critically-endangered hawksbill are among the species swimming in the UAE’s waters, and they sometimes run into trouble with injury or illness. The Burj Al Arab’s turtle rehabilitation programme can help them get better. If you spot a turtle you think is in trouble, give them a call on 04-3017198. “We have a policy that if a turtle can swim away on its own, don’t touch it,” said the hotel’s Warren Baverstock.